CIZA J2242.8+5301 (a.k.a. the Sausage) was first discovered by Kocevski et al (2007) as the second CIZA sample (a survey of clusters of galaxies behind the Milky Way. Its galactic coordinates are (104d11m20.61s, -05d06m15.87s), so it is very near the disk of the galaxy but away from the bulge. This explains the high extinction Av=1.382, and likely reason there have been limited optical studies of the system (with the exception of our ongoing lensing work and Stroe et al. 's (2013b) H-alpha study). Radio: van Weeren et al. (2010) conducted the first comprehensive radio survey of the system (including WSRT, GMRT, and VLA observations), with which they observed evidence of shock acceleration and spectral aging associated with the outward-moving shock (this was later confirmed with the follow-up study of Stroe et al. (2013)). They also observed that the northern relic is strongly polarized at the 50-60% level, and used this to infer that the merger angle must be within ~30 degrees of the plane of the sky. They also used the spectral index to infer a Mach number of ~4.6. Stroe et al. (2014) observed with the system with the Arcminute Microkelvin Imager at 16 GHz and presented the first high frequency detection of diffuse radio emission associated with clusters. They found diffuse emission at the northern radio relic but note that the detected flux is inconsistent with diffusive shock acceleration predictions. 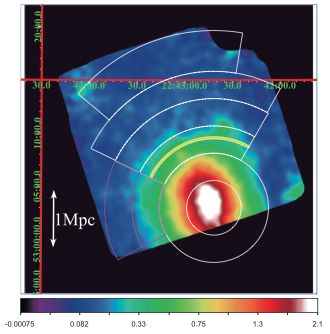 Simulations: van Weeren et al (2011) conducted a suite of simulations studying potential analogs to the system and argue that, "CIZA J2242.8+5301 is probably undergoing a merger in the plane of the sky (less than 10◦ from edge-on) with a mass ratio (M1:M2) of about 2:1, and an impact parameter 400 kpc. We find that the core passage of the clusters happened about 1 Gyr ago." Interestingly they suggest that the southern relic should be slightly less massive (given the relative size of the southern relic), but we are finding that lensing suggests the southern subcluster is slightly more massive. Kang et al. (2012) conducted diffusive shock acceleration simulations of the Sausage and found that Mach numbers from 2-4.5 were supported depending on the amount of pre-existing cosmic ray electrons. However, they question the ability of the merger event to produce such an elongated shock. X-ray: Two detailed X-ray analyses have been conducted, one with XMM-Newton (Ogrean et al. 2013ab) and one with Suzaku (Akamatsu et al. 2013). The Ogrean et al. (2013ab) analysis shows an extreme N-S elongation of the X-ray gas largely consistent with the merger axis suggested by the radio relics. The XMM instrumental background levels prevent them from characterizing the surface brightness profile at the location of the northern radio relic (this is remedied by the Akamatsu et al. 2013 Suzaku observations), however near the southern radio relic they find evidence for a shock with Mach number ~1.2-1.3. Ogrean et al. (2013ab) also note two interesting features of the gas. 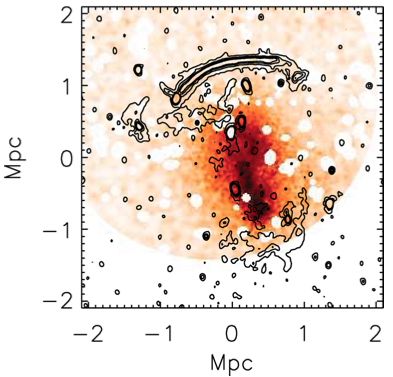 The first being a "wall" of hot gas east of the cluster center, and while not associated with a radio relic it does extend into the region behind the norther relic; they suggest that while a mystery it may be indicative a more complex merger scenario (e.g. a triple merger). The second being a "smudge" of enhanced X-ray emission coincident with the eastern ~1/5 of the northern radio relic. Akamatsu et al. (2013) found evidence for temperature jump at the location of the northern radio relic corresponding to a Mach number of 3.15+/-0.52, while lower than that predicted by the radio (4.6+/-1.3; van Weeren et al. 2010) they are consistent within the 68% confidence intervals. They did not see a jump in the surface brightness profile, but they claim that this is due to the large Suzaku PSF (~380 kpc) being much larger than the width of the relic (~55 kpc). Note that they do not observe a significant temperature jump in the region east of the cluster. 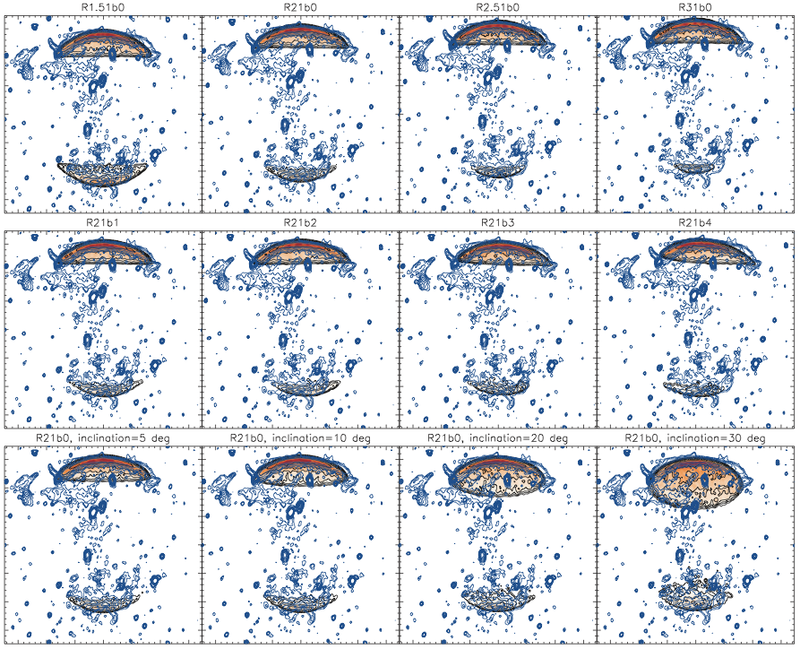 Galaxy Evolution: Stroe et al. (2013b) conducted an H-alpha survey of CIZA J2242. They find an order of magnitude boost in the normalization of the galaxy luminosity function in the vicinity of the relics, even greater than that of other known mergers at the same redshift. One important note is that they made assumptions about the contamination of their cluster H-alpha population, which we have since confirmed were conservative. Thus the boost in the luminosity function will be even greater than they estimated. Based on Subaru, XMM, and Figure 1 of van Weeren et al. (2010). Kocevski, D.D. et al., 2007. 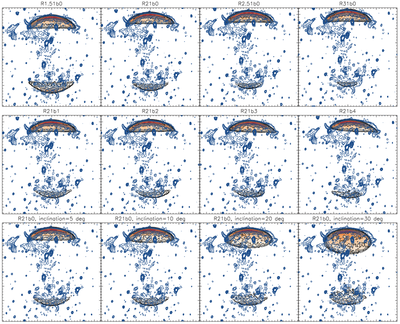 A Systematic X‐Ray Search for Clusters of Galaxies behind the Milky Way. II. The Second CIZA Subsample. The Astrophysical Journal, 662(1), pp.224–235. van Weeren, R.J. et al., 2010. 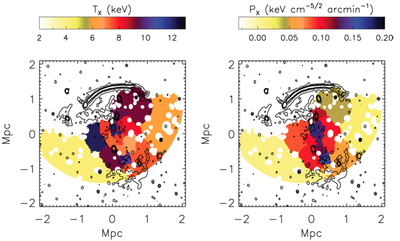 Particle Acceleration on Megaparsec Scales in a Merging Galaxy Cluster. Science, 330(6002), pp.347–. van Weeren, R.J. et al., 2011. Using double radio relics to constrain galaxy cluster mergers: a model of double radio relics in CIZA J2242.8+5301. Monthly Notices of the Royal Astronomical Society, 418(1), pp.230–243. Feretti, L. et al., 2012. Clusters of galaxies : observational properties of the diffuse radio emission. eprint arXiv:1205.1919. Kang, H., Ryu, D. & Jones, T.W., 2012. DIFFUSIVE SHOCK ACCELERATION SIMULATIONS OF RADIO RELICS. The Astrophysical Journal, 756(1), p.97. Akamatsu, H. & Kawahara, H., 2013. 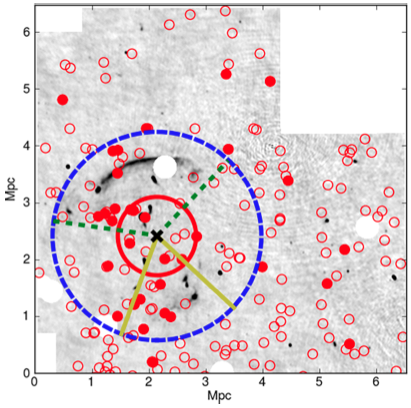 Systematic X-Ray Analysis of Radio Relic Clusters with Suzaku. Publications of the Astronomical Society of Japan, 65, p.16. Ohashi, T. et al., 2013. 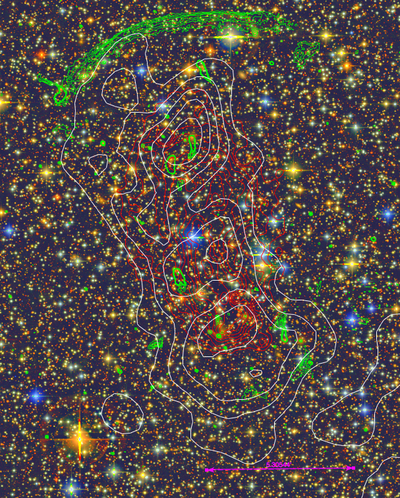 X-ray study of clusters at the outer edge and beyond. Astronomische Nachrichten, 334, p.325. Ogrean, G.A. et al., 2013a. XMM-Newton observations of the merging galaxy cluster CIZA J2242.8+5301. Monthly Notices of the Royal Astronomical Society, 429(3), pp.2617–2633. Ogrean, G. et al., 2013b. X-ray observations of the merging cluster CIZA J2242.8+5301. Astronomische Nachrichten, 334, pp.342–345. Röttgering, H. et al., 2013. 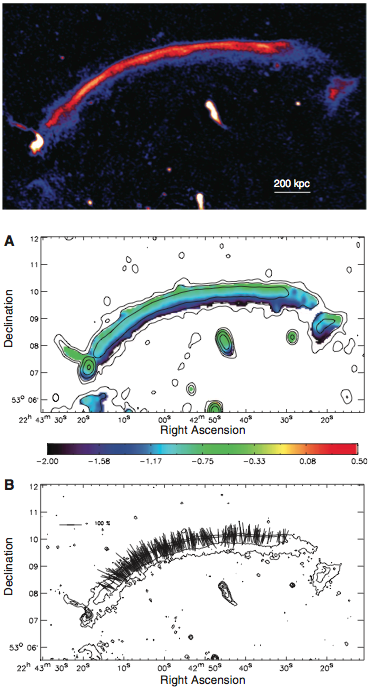 The ``Sausage'' and ``Toothbrush“” clusters of galaxies and the prospects of LOFAR observations of clusters of galaxies. Astronomische Nachrichten, Vol.334, Issue 4-5, p.333. Stroe, A. et al., 2013a. Discovery of spectral curvature in the shock downstream region: CIZA J2242.8+5301. eprint arXiv:1305.0005, 555, p.A110. Stroe, A. et al., 2013b. The role of cluster mergers and travelling shocks in shaping the H luminosity function at z 0.2: 'sausage' and “toothbrush” clusters. Monthly Notices of the Royal Astronomical Society, -1, p.2967. Stroe, A. et al., 2014. 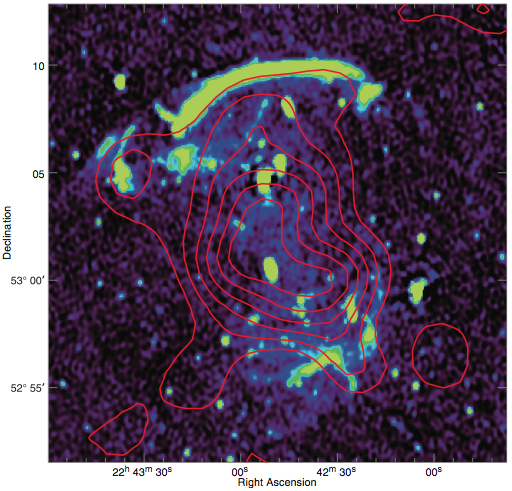 The highest-frequency detection of a radio relic: 16-GHz AMI observations of the `Sausage' cluster. eprint arXiv:1403.4255.
a. Dawson, Preliminary Redshift Analysis iPython Notebook, utilizing full DEIMOS spectroscopic sample.